You can do a Google search on this amplifier to get more information about it. These output transformers are gigantic, heavy, and very impressive. I also understand that a matched pair like this is quite rare. I have also provided pictures of the various wires associated with both transformers and a description of the resistance values across these wires (see the Description below). DESCRIPTION OF THE TRANSFORMERS. Each one weighs approx. 5 pounds and is approx. All dimensions and the above-listed weight are approximate as noted above. Check out the photo of the transformers next to a 12AX7 tube (tube not included) which shows just how huge these transformers are! Both of these transformers have the same numbers/letters on the bottom as shown in the photos. These numbers/letters are: 51-58 and 138026. I was told that the 138 in the 138026 number means that the transformers were made by Stancor. However, I dont know if this is correct or not and I do not know what these numbers mean. Cosmetically, the photos show the transformers from all angles and please feel free to check the photos out in detail. Both of the transformers look good for their age in my view as the photos show. The transformers do have a number of scrapes, nicks, dings, pits, scratches, missing paint, scuffs, etc. On especially on the tops of both transformers which have some scrapes, etc. Also, the wires coming from the transformers have some dirt, residue, nicks, scrapes, spots, etc. On them, with the wires being of different lengths as shown in the photos. However, in my opinion, the transformers do look good for their age and have a very impressive appearance. Each transformer has 7 wires coming out of it. There are two groups of wires coming out of each transformer. The FIRST GROUP of Wires involves: (1) a BLUE WIRE (wire A in the photos); (2) a STRIPED (wire B in the photos); and(3) a RED WIRE (wire C in the photos). The SECOND GROUP of wires involves: (1) a BLACK WIRE (wire D in the photos); (2) a BROWN WIRE (wire E in the photos); (3) a GREEN WIRE (wire F in the photos); and (4) a YELLOW WIRE (wire G in the photos). I measured the resistance across these wires using an ohm-meter and I obtained the following results (see the photos). FIRST GROUP OF WIRES. (1) Resistance across the BLUE WIRE A and the STRIPED WIRE B = 188 ohms. (2) Resistance across the STRIPED WIRE B and the RED WIRE C = 90 ohms; and. (3) Resistance across the RED WIRE C and the BLUE WIRE A = 98 ohms. SECOND GROUP OF WIRES. (1) Resistance across the BLACK WIRE D and the BROWN WIRE E = 0.4 ohms. (2) Resistance across the BLACK WIRE D and the GREEN WIRE F = 0.7 ohms; and. (3) Resistance across the BLACK WIRE D and the YELLOW WIRE G = 0.9 ohms. All of the above-listed resistance values are approximate and rounded to the nearest ohm. Also, I cannot guarantee the accuracy of the above-listed resistance readings. They would make a great addition to any vintage electronic collection. Feel free to check it out! They should therefore not be considered connect and use items. I have not done anything to these transformers and all of their parts, wiring, and components. The above-described transformers may have been worked on by someone else in the past, but I dont know whether this is true or not. No other items are included. However, I do not know how much repair work, parts, components, wiring work/replacement, etc. However, I will do my best to try and prevent these situations when I pack this equipment although I cannot guarantee that they wont happen. 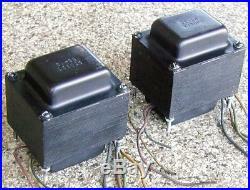 It is therefore important and necessary that both of these transformers (along with all of their parts, wiring, and components) be examined thoroughly by an electronic expert inside and out before these transformers are operated, tested, worked on, repaired, connected to any speaker(s), connected to any amplifier(s), connected to any other equipment, modified, disassembled, handled, and/or used. Any repairs to these transformers (and all of their parts, wiring, and components), as well as the connection of the transformers to any speakers(s), amplifier(s), other equipment, etc. And the use of these transformers and all of their parts, wiring, and components should only be attempted by an electronic expert. Furthermore, I cannot guarantee or warrant that your ohm-meter will provide the same resistance values associated with the transformers that my meter provided as outlined above. I have no idea whether everything is original or not in the above-listed transformers and I therefore cannot make any warranties regarding originality. I also do not warrant that these transformers are complete and I do not know if there are any missing parts, components, wiring, etc. The item “RARE VINTAGE PAIR OF LARGE OUTPUT TRANSFORMERS FROM QUAD 7591 TUBE AMP AMPLIFIER” is in sale since Tuesday, October 23, 2018. This item is in the category “Consumer Electronics\Vintage Electronics\Vintage Audio & Video\Vintage Parts & Accessories\Vintage Transformers”. The seller is “jaymalkin” and is located in Wheat Ridge, Colorado. This item can be shipped to United States. This entry was posted on Sunday, October 28th, 2018 at 12:01 pm	and is filed under rare. You can follow any responses to this entry through the RSS 2.0 feed. Both comments and pings are currently closed.